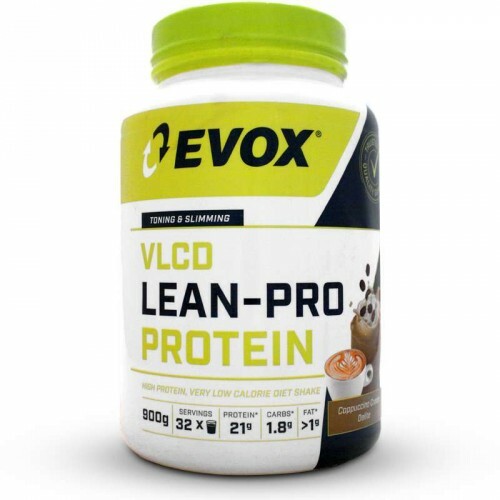 EVOX Lean-Pro Protein mixes instantly, tastes great and is the preferred choice for dietary management of physically active or dieting individuals, thus providing a convenient way for precise caloric and macro-nutrient control. 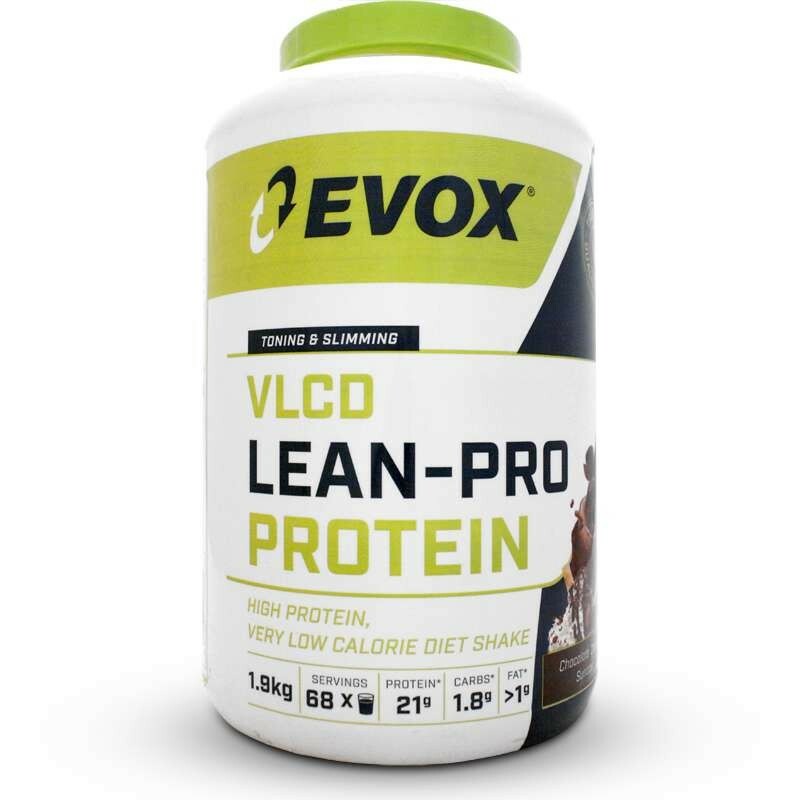 Evox Lean-Pro Protein is designed to help you lose weight for a leaner, harder and better looking body. This uniquely specialised high protein, low carb nutritional supplement, rich with essential micro-nutrient combination have been shown to reduce appetite and cravings, increase and stabilize energy levels and curb sugar and carbohydrate cravings and control appetite. *% Nutrient reference values (NRVs) for individuals 4 years and older (2010). PURE-LEAN Protein Blend: (Whey Protein Concentrate 80%, Soy Protein Isolate 90%, Caseinate Calcium), Cocoa Powder (Only in Chocolate Variant), Flavouring, Creamer, Sodium Chloride, Non-Nutritive Sweetener (Sodium Cyclamate, Sodium Saccharin and Acesulfame-K), Essential Fatty Acid Powder (EFA), Orafti-Synergy1 (Oligofructose Enriched Inulin Fibre), Colloidal Silicone Dioxide, Soy Lecithin, Garcinia Cambogia, Xanthan Gum. Manufactured in a facility that processes Egg, Wheat (Gluten) & Nuts. • Mix 2 Heaped scoops (28g) with 200 - 300ml cold water or skim milk. • Add or remove water or skim milk to acquire desirable taste and thickness. • Can be used to supplement your mid-morning and mid-afternoon meals. • Is best used for active individuals on a slimming or diet program. Best tasting, no lumps, feel fuller for longer. I use Lean Pro MRP. Just bought a second flavour but the Double Choc tastes amazing. Whizz with a bit of sugar free peanut butter and it's simply delish! Very good product. Helps with cravings and does not give you insulin spikes like all the other shakes. I am a firm believer in Evox Lean Pro. I've used it for 2 months and lost 10kg with minimal exercise and did not belong to a gym at the time. Recently I decided to do it again as well as listed the support of 3 friends, each of whom lost, 3, 4 and 6kgs respectively in the last 2 weeks. I've thus far lost 3 myself. Best tasting, best mixing protein shake ever!!! I bought this for my girlfriend and I a month ago as I have never gone wrong with EVOX before. However, it left us both feeling bloated every time we used it, like we had both been pregnant. Wont ever use it again.